Gosh, it feels like time is moving at lightning speed and hurling straight into the holidays. How is it possible that Thanksgiving is only 9 days away?! We’re flying up to Portland for Thanksgiving and spending it with my best friend, Katie and her dude! I can’t wait for all the crunchy leaves, cozy vibes, cheese (Tillamook! ), and the copious amounts of craft beer curated by Reuben. (Are you impressed with the level of alliteration in that last sentence?) Before we get on that plane to Portland, I have about 138,247,103 things to cross off my to-do list. I’m heading to LA/Bakersfield for a quick work trip tomorrow. So that will be a fun little break in the middle of a crazy work week. I’ll get to hug and squeeze my other best friend, Kate, in LA for a hot second. Can’t complain about some BFF time! I made the conscious decision to just lay low and be lazy this past weekend. Reuben and I double teamed on the most amazing baked ziti on Friday that happily fed us all weekend long. On Saturday we spent the day celebrating the marriage of one of my dear friends, Jess! And then on Sunday we were a bunch of lazy blanket burritos. Reuben watched football all day (sorry, Eagles) and I got caught up on some photo editing and the Chilling Adventures of Sabrina. I didn’t realize how badly I needed that lazy day! I had a recipe I was going to test, but I just wasn’t in the mood to stand in the kitchen for a few hours attempting to make whipped cream look exciting. Plus, my version for that recipe has change slightly over the last few days and I think it’s going to look a lot better when I made it this Sunday instead! Sometimes we just have to be patient with our creative process. Thankfully, I busted my booty in the kitchen the last month and stocked up on recipes so that I could take a day off from the kitchen when I desperately need to. Sort of like a blogging sick day. I’ve been super antsy to share this donut recipe with you guys because it is just so freaking good! The donuts on their own are so tender and fluffy. I feel like I always say this, but they were also super easy to make. I’m not lying though. If you feel like you’re going to crave donuts tomorrow, all you have to do is throw some flour, sugar, and butter in the bowl of your standmixer and let it go for a few minutes. Then tuck the dough in for a sweet sleep in your refrigerator and in the morning you’ll have the softest and dreamiest dough! THEN THEN THEN there is the vanilla pumpkin jam. Omg can I just put it on everything?? The jam was inspired by this incredible pumpkin jam we had while staying in Granada, Spain. I remember we were sitting outside of a cafe at this tiny table. I was being annoying and trying to take a cute photo of our coffee and toast, but as I sat down I knocked the table with my clumsy knee and spilled my coffee everywhere. Thankfully, my buttered toast with pumpkin jam was only slightly covered in coffee and tasted incredible. I went back inside and bought a jar of pumpkin jam to take home. I went through that jar way too fast and have been dreaming about it ever since. I’m super excited that I can make my own vanilla pumpkin jam now because it is such a lovely treat to have on good bread and fresh butter! I had it for breakfast this morning : ) The donut and pumpkin jam together is definitely the IT couple of this Thanksgiving season! Okay, I gotta pack and finish designing this roof top bar and coffee shop! Where’s my terrazzo sample? Preheat oven to 400 degrees. Cut pumpkin in half. Leave the seeds in, they are easier to remove after baking. Place the pumpkin halves cut side down on a baking tray and roast in the oven for 35-45 minutes until tender. Remove the pumpkin from the oven and allow to cool. Once cool enough to handle, scoop out the seeds (discard or save for roasting) and the pumpkin flesh. Either puree the pumpkin in a food processor or immersion blender until smooth. Heat a saucepan over medium heat. Add the puree, sugar, juice of 1 lemon, and salt. Scrape the seeds from a vanilla bean with a paring knife. Stir the mixture frequently while it’s cooking to prevent it from burning. Cook for 8-10 minutes until the jam has thickened. Store the jam in glass jars until ready to use. Combine yeast, milk, and a pinch of sugar in the bowl of a standmixer fitted with a dough hook. Give it a quick stir and then let it sit for 5 minutes to allow the yeast to bloom. Add flour, 1/3 cup sugar, salt, and eggs. Mix on low speed for 3 minutes. Increase speed to medium and start adding your softened butter piece by piece. Continue to mix dough for another 5 minutes until the butter is incorporated and the dough is soft and smooth. Grease a large bowl with 1 tsp canola oil. Add dough into the bowl and cover with plastic wrap. You can either proof the dough in a warm place for 2 hours or let sit in the fridge overnight for 12-15 hours. I let it proof over night. After the first proof, light flour your work surface. Roll out the dough until it is about 1/2 inch thick. Using a 3” biscuit cutter, cut out your donuts. Place donuts on a light flour baking tray lined with parchment paper. Cover with plastic wrap or a kitchen towel and allow to proof for another 30-45 minutes. They should have doubled in size and feel super pillowly. You can also cut up your dough scraps to fry up as well. While the donuts are proofing, heat canola oil in a heavy bottom pot to 350 degrees. Make sure you have at least 3” of oil. If you don’t have a thermometer, you can test the temperature using some scrap pieces of dough. Once the dough hits the oil, it should sizzle but not get dark too quickly. It should gradually get golden brown on 1 side within 1-2 minutes. If it darks quickly, the oil is too hot. Working in batches, add donuts into the oil. Fry the first side for 2 minutes, until golden brown. Using tongs or chop sticks, flip the donuts and fry on the other side for another 2 minutes. Using a slotted spoon or a spider, transfer the donuts from the oil to a wire rack to cool. Repeat with remaining donuts. While the donuts are still warm, toss them in sugar mixed with cinnamon until evenly coated. Alternatively, you could also dust them in powdered sugar. To fill the donuts, fill a piping bag fitted with a round piping tip with pumpkin jam. Poke a hole into the side of the donut and fill the donut with jam. Repeat with remaining donuts and enjoy! Pumpkin Jam recipe adapted from this! And I used this donut dough base! Hey hey hey! I’m writing at another ski lodge again. It is equally as distracting as the last ski lodge I wrote at. Except it doesn’t quite smell like sweat, chicken fingers and donuts. I snagged myself a nice sunny table outside. So it smells like clean mountain air and bbq from the bqq tent 15 feet from me. I am surrounded by children bickering over pizza in German, but I’m hoping they leave soon. It’s Easter Sunday. Not that that really means anything to me. When my brother and I were little, my family would entertain us with the always fun Easter egg hunt, egg dyeing, and copious amounts of Easter candy. I feel like Easter is the most magical for kids. As my brother and I and our cousins grew older, Easter festivities started to fade. Plus my family is not really religious at all. I think this weekend would just be another weekend that we would all get together for Dim Sum or lunch at my grandparents’ house. Reuben and I have spent this Easter weekend up in Auburn, California enjoying some nature. He is skiing in Tahoe today (Sunday), which is why I am writing at a ski lodge again. As much as I’ve enjoyed all the beautiful sites and the great food this weekend, I can’t seem to shake the little bit of homesickness I’ve been feeling. Even though Easter is not a big deal for my family and I don’t even think they are getting together this weekend, I still miss the crap out of home. I probably bring up homesickness on this blog all the time. Maybe a little too much… sorry! When you’re the only one from your family that lives far away, you start to get really sappy. Thankfully I’m going home in 3 weeks! Work is taking me to Chicago so I’m going to hop on an extra plane to get my family fix. I actually just realized that I’m going to be away almost every weekend in April. Next weekend I’ll be home. But then after that I have a weekend in Palm Springs, Cleveland, and then Seattle. All very exhausting and exciting. 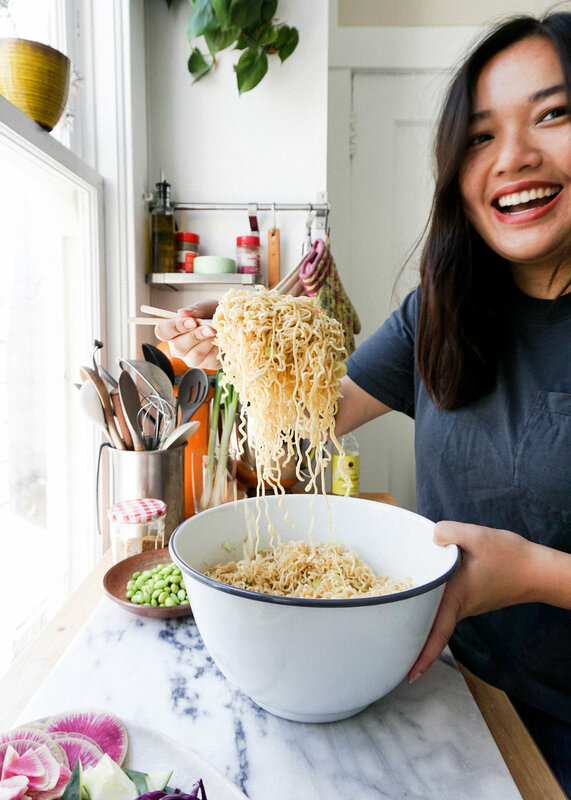 Since I do all my recipe testing and photography on the weekends, I’ll be a tornado in the kitchen this weekend so that EatChoFood is not a vacant wasteland for the month of April! I do this for you. I have this ridiculous google doc where I put all my of random recipe ideas. You never know when inspiration is going to hit you! Some of the recipes are weird. Some of them aren’t really coherent, just a stringing of words that described something that’s hopefully edible. I should be able to take a pretty good chunk off the list next weekend. 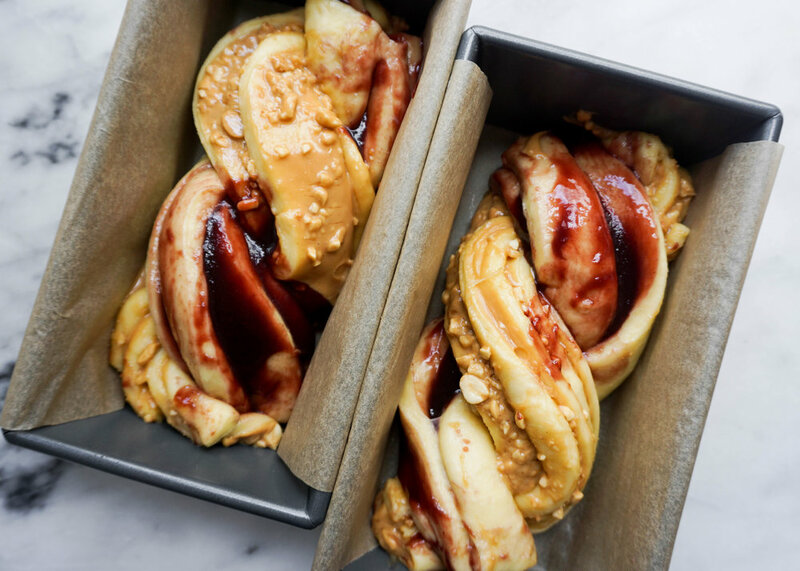 One thing that has been on my recipe google doc for the longest time is Peanut Butter and Jelly Babka. It has to have been on there for at least a year. I’ve made a babka a few years ago and it turned out okay. I think I rushed it. It tasted great, but the effort involved sort of made me not want to make a babka for a while. Until a month ago! I first tested out this recipe a month ago and it was not perfect. I made my own jam and it was just a little too loose, so the jam just disappeared after it was baked. The second issue was that it didn’t bake long enough. I trusted the base recipe with the cooking time, and it was definitely 15 minutes shy from a full bake. It ended up tasting fine and my coworkers loved it, but I knew I could do better. So I took my notes and tweaked my game plan. Cooked it longer, bought jam from a professional, and made some other flavor adjustments. It freaking worked! It’s so satisfying to see an experiment work out. You feel like a scientist of something! The bread is super light and fluffily. The jam is very present and tart to balance the sweet an thick peanut butter. My mom would always use grape jelly in our PB&Js so that flavor has been ingrained in my brain. I used blackberry preserves, which comes pretty close to grape jelly. But you can use whatever jam, jelly, or preserve that you like! The top has a sweet and shiny glaze that adds the perfect amount of sweetness to a not super sweet bread. It’s so good with a glass of cold milk! Eating it fresh is definitely best, but I also had a slice with some yogurt and it was almost like having birthday cake for breakfast. That’s the dream right? I also think that it is totally justifiable to eat this babka for lunch because people eat PB&J sandwiches all the time! Right? So I say go for it. Eat it all day long! 1. Place flour, sugar, and yeast into a stand mixer fitted with a dough hook and mix on low speed for 1 minute. Slowly add in eggs and water and mix for another 3 minutes at medium speed. Add salt and butter a few cubes at a time until incorporated into the dough. Mix dough at medium speed for 10 minutes. Scrape down the sides every few minutes. Remove dough from the bowl and shape on the counter into a smooth round dough ball. 2. Brush a bowl with 1 tbsp olive oil and place dough in the bowl. Cover with plastic wrap and leave in the fridge overnight or atleast 12 hours. 3. Remove the dough from the fridge and leave out on the counter for 30 mins to get the chill off the dough. Divide the dough in half. Roll out half the dough into 15"x15" rectangle on a lightly floured surface. 4. Spread creamy peanut butter with an offset spatula over the rectangle. Drizzle honey and sprinkle the crushed peanuts. Begin rolling the dough by starting with the 15" long edge and continue to tightly roll until you reach the other long edge. Trim about 3/4" to 1" off either end. With a really sharp knife, cut the roll in half lengthwise. Set aside and repeat with the jam filling. 5. Line 2 loaf pans with parchment paper. Take one peanut butter half and one jam half and place them side by side with the cut side facing up. Pinch one end together and cross one half over the other half. Repeat until the halves are braided. It's going to get really messy, but it's worth it! Carefully lift the braided loaf and place in the parchment lined loaf pan. Use a large spatula or dough scraper if you feel like you need some help. Repeat to make the second loaf. 6. Cover the loaf pans with a damp paper towel. Place in a warm place and allow to proof for 90 minutes. 7. Preheat oven to 375 degrees. Place the loaves in the oven and bake for 40-45 minutes until deeply golden. If it starts to get a little too dark, cover the loaves with foil. The internal temperature should be 185 degrees. 8. While the loaves bake, make your syrup. Combine the water and sugar in a small sauce pan. Bring to a boil over medium heat. Once the sugar dissolves, remove from heat and allow to cool down. 9. Remove the loaves from the oven and immediately brush the babkas with the syrup. It seems like a lot but use all of it. Allow the babkas to to cool in the pan until warm. Remove from the pan and allow to completely cool on a cooling rack.